Something you don’t see a lot of in Finland is street evangelism. I got to participate in some creative street evangelism today. Before I go any further though, let me define what I’m talking about. I’m not talking about yelling at people that they are going to hell unless they believe in Jesus. I’m not talking about jumping right to a conversation about church either. I have learned that those methods are rude, for one thing, counter productive and not seeing the people you talk with as, well, people. I was with a couple of church workers in Olari today. One of the church workers had the idea to drive around Matinkylä and offer people some free coffee, talk with people and hand out some information about the upcoming worship service and the offer of free bread on Tuesdays at the chapel. Pretty non-threatening actually. We drove around, found a location and set up shop. We didn’t know if anyone would walk by, if they would take the free coffee, if they wanted to talk, or anything else. We just made ourselves available and offered free coffee. We had a pretty constant flow of people stopping to have free coffee. We’d talk with them about anything they wanted to talk about. We also handed out some fliers about worship on Sunday and the free bread the church is giving away on Tuesday. It was really quite a success. And I learned several things from the experience. 1. Be open and available – We weren’t there to try to convert people, but to be available to talk with people. We were surprised by how many people would stay and talk while they drank their coffee. We let them lead the discussion so they would be comfortable in being open and feel welcome. What we found is that most of the people coming and stopping needed human contact. It was inevitable that church would come up in several conversations. For others, even mentioning church would have probably ended the conversation quickly. We saw this as one step towards connecting with people. 2. 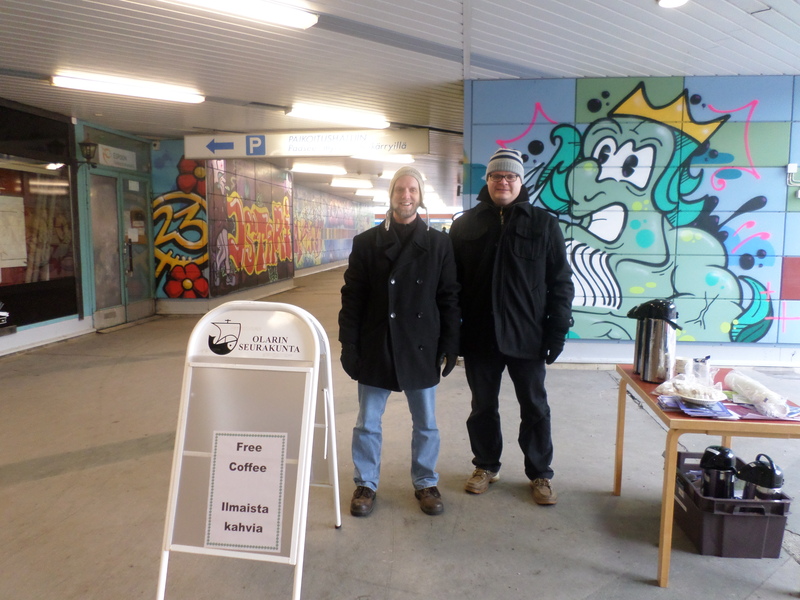 Language is important – I learned the Finnish way of asking people if they wanted free coffee – ilmaista kahvia, just in case you happen to be in Finland and want to offer some free coffee. Anyway, this was important – I was speaking the language of the people passing by. Now, of course, my Finnish is limited, so I could not carry on a full conversation with many people, but it was an opening and a welcoming for people. My friends did most of the talking. Although I was able to talk with a couple of people who were patient with my poor Finnish or who knew English. 3. Context is important – I’ve said this a bazillion times. We were dressed in jeans and winter coats – very common clothing. This fit the area where we were. We were not a threat to anyone and looked like we fit in. If you want to talk with people, speak with them on their terms and in a way they can connect with. 4. Information is important, but it is only supplemental. You can have the greatest looking handout in the world, but that can’t do what people can – create/start a relationship. Christianity is about relationships – people to people contact. We had a bunch of fliers and brochures about the church, but they kept blowing away with the wind, so we put them away. We handed the appropriate ones to people who seemed interested in either bread or the church service. It seemed as though only having the coffee out made us even more approachable – people could see we weren’t trying selling them something. This opened the space for conversation with people and they took the opportunity to do just that – talk. 5. Expectations are important – Not everyone stopped for coffee – some were in a hurry, some had just bought coffee, some ignored us altogether, some said no thank you as they walked by. That was ok. We didn’t expect everyone to stop – we didn’t expect anything. We were just thrilled by having anyone stop to talk, take a rest, drink some coffee on a cold day and share some information about the church. Overall, it was a great experience – I can’t wait to do it again.